Do you have any idea who this is? It is actually me in the year 2002 BC (Before Creativity) – how absolutely bored, grey and miserable did I look? It even shocks me!!!! You see at that time I had abandoned my creativity for over 20 years. I’d convinced myself that creativity was something other people did. Painting and drawing were for people who went to art school. My dreams were put in a box on the shelf and were not to be taken out and looked at. OMG what a dull dull life!!! Playing with colour, playing with paint, playing with crayons, coloured pens you name it – it didn’t matter I’d found the start of my road to being Happier! It was around the age of 40 when I took up art, and was hooked from the first class. Even when my art teacher told me all the things I was doing wrong, and in my report said “Acrylic painting is not Angela’s friend” I didn’t give up – I decided that I was going to play, have fun and rediscover my inner child. My inner child wanted to FINGER PAINT!!! and so I took evening classes, and online classes and I learned to PLAY. I have now being teaching students the ART of PLAY – ladies who are absolute beginners, who think they aren’t creative and have proved themselves wrong! 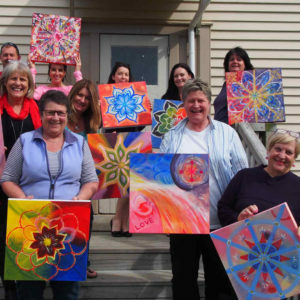 I’ve been teaching ‘Painting Happiness’ in New Zealand and the UK for over 3 years and my students LOVE LOVE LOVE it! I was determined not to be the kind of teacher I had experienced, I was going to be supportive, open to go with the flow of the student, coaching and allowing them to find their own creative voice – I wanted them to love the ART of PLAY as much as me. 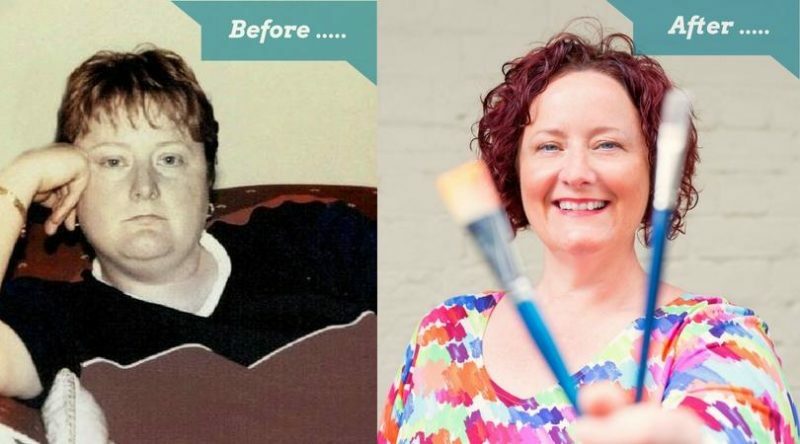 So with a combination of simple creative processes (which anyone can learn) with DREAM evoking coaching sprinkled liberally throughout the experience my ‘Painting Happiness Experiences’ have been highly successful – oh and FUN! So now I am on a mission to bring this to the world! and after 2 years of working on this today I am SUPER EXCITED to be officially announcing ….. on 12th February I am launching ‘Painting Happiness Online’!!! If you know there is more to life than what you have now. If you know that you have dreams inside that are excited to come out. If you have forgotten what it feels like to get messy for the FUN of it, and your inner child wants to come out and PLAY with paint. If you want an easy creative practice to bring more FREEDOM, FUN and FLOW into your life. Don’t wait!!! Join me online for 6 weeks from 12th February 2017 – and this could be your before and after picture too!! I can’t wait to see you there – I know you will love it!!! PS Really don’t wait!!! Join me online for 6 weeks from 12th February 2017 – click HERE for more info and to book. Wow! I would never recognize you! And NOW you bring hat color to so many people’s lives! Love you!!! Thank you Whitney – I absolutely love what I do, and because I know it made such a difference to my life I really can;t help but want to bring it to other ladies too – I can’t put into words what this process does for you. I just want to show everyone!!! Great inspirational story and gift to the world of grey. Love this Angela! The best cosmetic fix is JOY! Wonderful way to introduce a course and to spread your beautiful light! So glad to have met the Creative You!” Your Joy is contagious! I love this! What a transformation. I too had blocked off my creativity and was sick from doing so. Picked up that paint brush and joy came back into my life….great work you are doing! Thanks Beth – it makes such a difference to allow yourself time to create and be in touch with yourself. I get tetchy now when I don’t create ?